A happy and safe New Year to all of you. 1 January - A dull damp start to the new year, with an air temperature of 6C when I took this photograph at 10.45pm. Tonight I could see six frogs in the ponds with a couple, like this one, out in the open, probably in response to the higher temperatures. If you look at the larger image you will see that it seems to be 'blinking' its right eye. 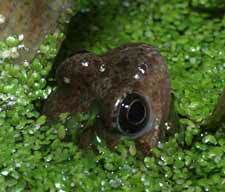 The frog's lower eyelid is a milky coloured translucent membrane, which you can see here partly covering the eye. 7 January - Little to report on the pond since last time. The frog count hasn't progressed above six, despite the mild weather, and the 'usuals' continue to wait patiently! I did come across an adult newt while working in the garden. It was hidden under some dead leaves I wanted to move - they went back into place straight away. I need to do a bit more clearing in the big pond in the next week, weather permitting. 9 January - Seven frogs in sight last night, with two of then (including this one, looking as though it could do with a good meal!) out in the open at the side of the big pond. 11 January - Still only seven frogs, including this pair. This is a very different start from last year when we had some 28 frogs in the pond(s). 17 January - Nothing to report in the way of progress in the ponds. 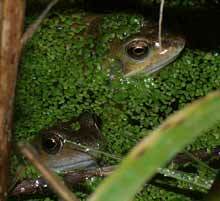 The frog count remains low, with daily checks revealing between four and six each night. Night-time temperatures have been below 5C, which does not encourage activity. Last night's frost left the bird bath frozen over but did not produce any ice on the ponds. 23 January - In the last three days (nights) the frog count has gone up to 14. The weather has continued to be mild but the forecast is for a cold spell next week with a possibility of frosts and snow. 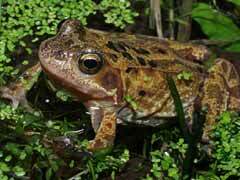 Hopefully the frogs that have turned up will find refuge during this time.